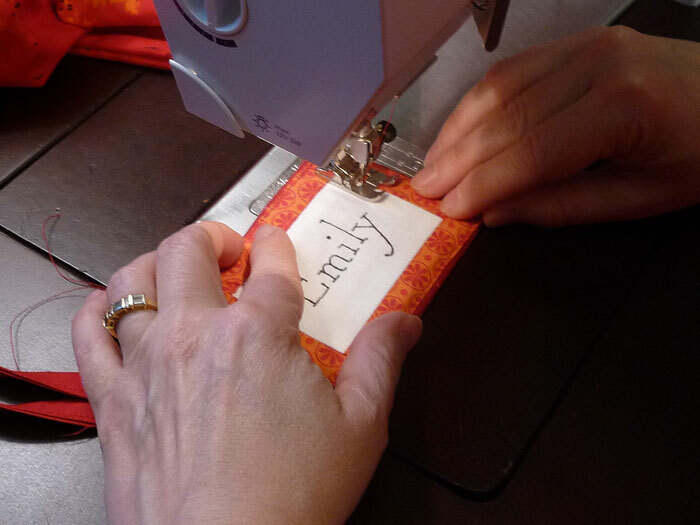 In my very first Craft Nectar post I wrote about making cloth drawstring bags with personalized tags for kids’ birthday parties. 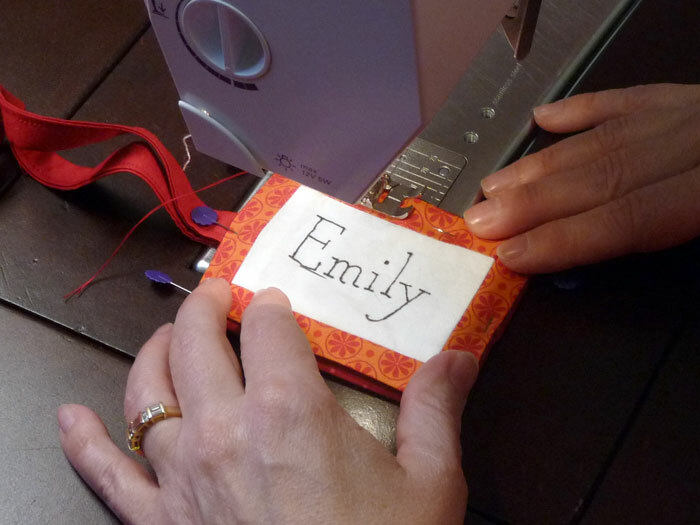 While making another one for a birthday party this weekend I thought I’d document the making of the personalized tag in case you wanted to make one for your bag. 1. 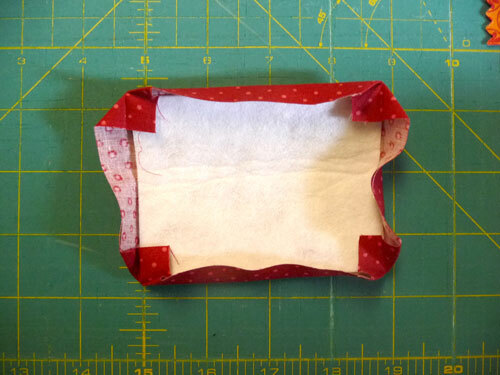 If you’re using bias tape, sew the open edge closed. 2. 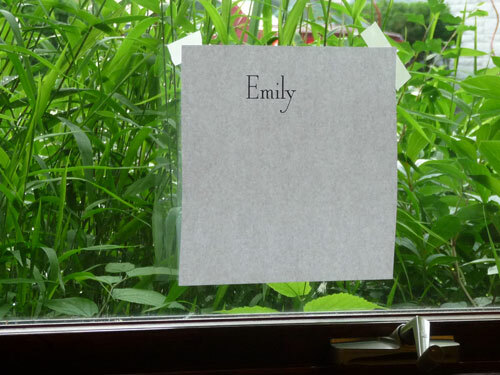 Tape the name printout on a window with good light behind it. 3. 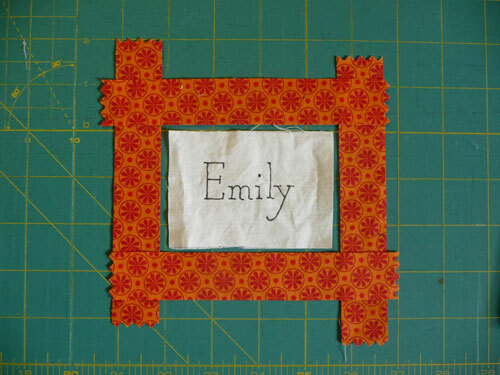 Center the fabric on the name and tape it onto the printout. 4. 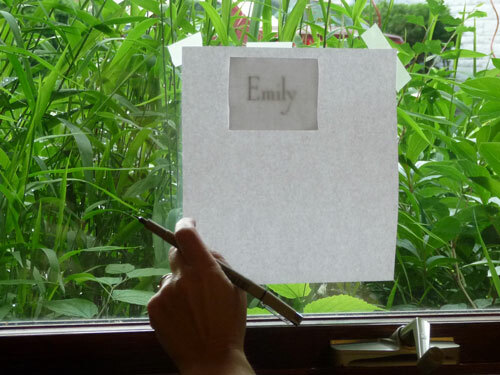 Using the fabric pen, trace the name onto the fabric. 5. 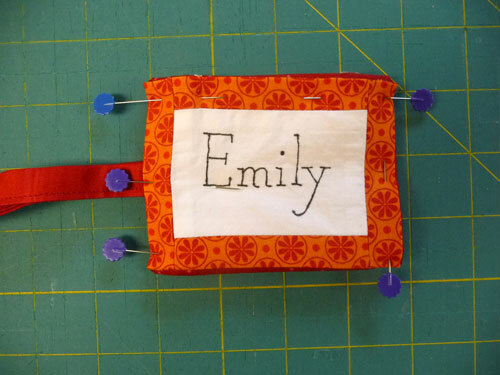 Sew the frame strips around the fabric with the name on it. 6. Trim and iron the seams open. 7. Iron a scant ½” fold all the way around the perimeter of the backing fabric. 8. Open the ironed edges and place the stabilizer on the wrong side of the fabric as shown in the photo. 9. Miter the edges as shown in the photo and lightly glue closed. 10. Iron a scant ½” fold of the name side of the tag. 11. Pin wrong sides together inserting the raw edges of the bias tape along the center of the left edge of the tag as shown in the photo. 12. Sew around the perimeter of the tag as close to the edge as you can imagine, making sure that the bias tape is sewn securely. 13. 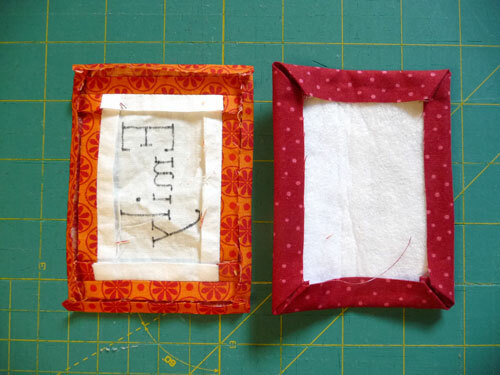 Stitch in the seam between the white fabric and the frame fabric to create a crisp frame. Oh this is great! This tutorial was before my time so it’s my first time seeing it. I’ll be linking. What a great project and a wonderful job writing up the tutorial. Thank you! Great timing… Brownie Day Camp starts tomorrow! I made one for my grand daughter this afternoon! Thanks. Love the idea for a party favor. 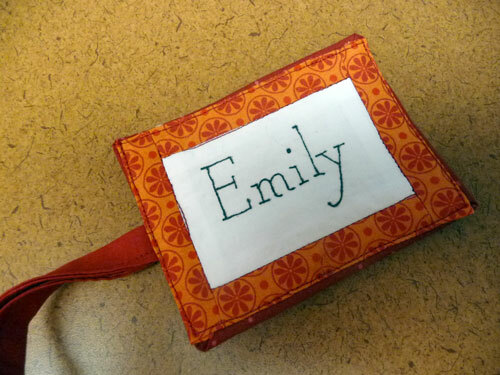 I have made a similar tag using a piece of vinyl, open at the top, for a business card to be used as a luggage tag.